The day after the first time I ever lifted weights, my muscles were so sore that it was almost too painful to sit down. That was actually pretty handy, because I didn't have the strength to stand back up again unless I had something to hold on to. I may have overdone it a little. Frankly, I'm not sure I know when to stop. Fortunately, this isn't about fitness advice; it's about sore muscles. And, thanks to my intemperate approach to exercise, I have learned a few highly effective ways to treat those aches and pains and get back on track. Here are eight of my best sore-muscle remedies. No matter what kind of workout you're doing, getting to maximum intensity in minimum time is not a good idea. This will become particularly noticeable when you've surpassed the ripe old age of 30 (like me!). If you're running, start slow, or walk a few blocks before you hit your stride. The same goes for swimming, cycling, tennis, or whatever you're into. You don't need an elaborate warm-up routine. Just do some gentle movements that are similar to the higher-intensity version of what you'll be doing until you stop feeling stiff. Your body will thank you for it. Especially tomorrow. Whether or not to stretch is a big question in the exercise community right now. Some studies have found that it has no "statistically significant" effect on post-muscle soreness or injury risk. Others have found that stretching before a workout can actually reduce performance and increase the risk of injury. One thing everyone can agree on is that stretching increases and maintains flexibility and range of motion. If you participate in a repetitive endurance sport and/or sit at a desk all day (I do both), that's pretty important. Does it reduce the chance of injury? I can't say for sure, but if you've ever seen a middle-aged marathoner try to tie his or her shoes, it might just convince you to keep a little flexibility work in your routine, if only to ensure your toes remain within reach. If you're really active, things will hurt. Your knee will get sore. Your shoulder will be tight. Your feet will ache. As long as it passes, it's often a sign that your body's rebuilding and getting stronger. In response, many people reach for the anti-inflammatories. They work, but they aren't very good for you, and they definitely shouldn't be used on a regular basis. What you can do is incorporate a lot of anti-inflammatory foods into your diet. I've found that whether I'm injured or just a little sore, these three foods reduce pain as much as over-the-counter drugs. Research conducted by Oregon Health & Science University found that consuming tart cherry juice while training for a long-distance run significantly reduced pain following exercise. Another study even found that drinking tart cherry juice twice daily for three weeks significantly reduced inflammation among a group of women suffering from osteoarthritis. Apparently, these bright-red fruits contain anthocyanins, which may reduce inflammation levels (and therefore pain) as effectively as some well-known pain medications. If you like cherries (or cherry cough syrup), you'll love this tart-tasting juice. Just be sure to get 100% juice, rather than a juice blend. OK, people, I'm going to recommend a couple of herbal supplements here, but this is not some hippie-dippy thing. I've tried this. It works. And there's 30 years' worth of studies to back me up here. You can use ginger in curries, make ginger tea, or even snack on dried candied ginger. Turmeric is another anti-inflammatory spice with a lot of believers. It belongs to the ginger family (go figure), but its active ingredient is curcumin which, like gingerol, inhibits several of the molecules involved in inflammation. A review of six major studies on turmeric found it to be safe and effective at reducing inflammation and pain. When a fall off my bike last summer left my knee so swollen I couldn't bend it, I took turmeric by the spoonful (along with ginger and cherry juice; I leave no stone unturned). It healed up quickly, and I was back in action in little more than a week. Turmeric is common in many curries, but you can also take it in caplet form, by the spoonful, or make this surprisingly tasty turmeric tea. Compression can be great for inflammation. If you're feeling stiff and sore and have some recovering to do, a pair of compression socks or arm sleeves can work wonders. Be forewarned that knee-high socks tend to make a bit of a statement. If you're self-conscious, consider hiding them under a pair of pants. If your legs hurt, it feels great to prop them up high on a pillow, or even right up against a wall. Actually, this is a good pose even if you feel just fine. Long-distance runners often take ice baths to prevent soreness and injury. This entails filling a bathtub with cold water, dumping in a few buckets of ice, and hopping in for up to 20 minutes. You will cry for your mother if you manage to get all the way in there. I consider that a last resort. I do, however, recommend ice in general. You can freeze a paper cup full of water and peel back the sides to expose the ice and give yourself an "ice massage." You can also pop an ice pack into a compression bandage (Tensor makes some especially for this purpose). Ice for 15 minutes or so at a time, and then allow your skin to warm up again before re-applying. Just keep in mind that ice works best for aches in less fleshy areas, such as your ankles, shins, knees, and elbows. If everything hurts, there's always that ice bath. Overall, I've found that these remedies will produce results within a day or two. And, hey, if all else fails, you can always take a few days off. 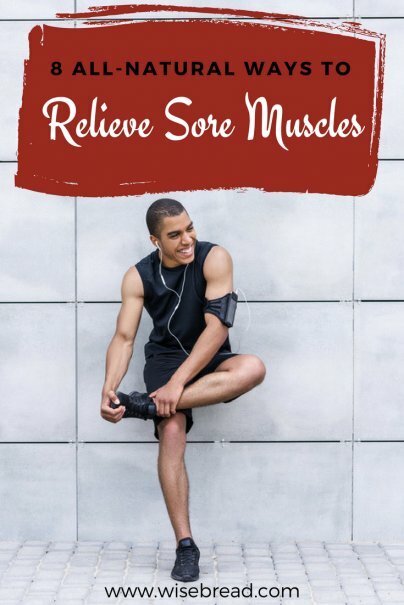 What remedies do you use for sore muscles? Share them in the comments! Warm compresses work wonders to soothe sore muscles. Doing them with an herb like peppermint makes it all the better.